The Radioactive Yak: Google-Vision: Is Google TV on its way? I've speculated on this in the past, but a review of recent Google job openings may show a move into the interactive TV market is on the cards. Google are advertising for an Interactive TV Product Manager in Mountain View, as well as Sofware Engineers with experience in 'emerging TV standards' and 'deploying robust, high-volume applications for consumer devices' in both the Mountain View and London offices. The Interactive TV product manager at Google would be identifying 'projects that enable using Google's search and advertising technologies to enhance users' Television viewing experience.'. All signs indicate that any plans are at an early stage, but it seems that Google, much like major players Apple, Sony, and Microsoft are looking to move off the computer, and into your living room. This is potentially a very smart move by Google, as the future of TV is going to revolve more and more around finding content you want to watch, particularly as on-demand and PVR devices and services become more popular. Fewer people will be chanel surfing, and more people will want to sit down and literally search for something to watch. Advertising too will change. With video-on-demand time-slot based demographic TV spots make less sense, and Google's contextual advertising model seems an excellent fit. 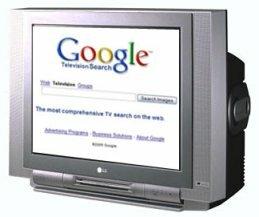 So with search and advertising as its core business, Google are in a unique position to leverage their strengths into the enormous consumer base that TV does, and will continue to offer. In other Google job news, a browse of the Google UK jobs reveals no fewer than four engineering positions for mobile developers, including UI designers, team leaders, server, and application developers. It certainly seems that Google are putting a high priority on mobile accessability. Which is Good Thing. Personally I hope this means Google Local Mobile will be coming to the UK soon. I think it is a logical thing for Google to explore to exploit convergence underway to IPTV. I see it as an example of using deep science to restructure the advertising industry that has too long focused on the 'art' of advertising. Worth watching for how Yahoo, Microsoft and Sony respond (as also how the traditional advertisng agencies evolve their competencies). Ah, Google's Product Team playing around again. And then they bought YouTube! IPTV and Google will be back again - who needs MTV when you have YouTube = instant TV channel.